Last week we went down to Bannermans which is in Edinburgh, Scotland. We had a cracking night playing along side bands such as: Killheathen, Firebrand Super Rock, and our friends from Norway called Toxic. Every single band was excellent, and they were each slightly different genres, so it was a dream gig come true. We arrived in Scotland and we met up with Toxic. 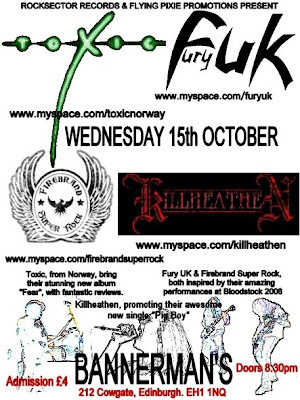 Toxic are also doing a 2 week tour with Killheathen. We checked into our hotel room at the Travel Lodge and had a quick break or sleep we should say. lol. Also a special guest appeared all the way from Newcastle, called Simon Colling from NE1 FM Radio, juts to watch the bands and he was amazed with the turn out and loved each band. After the gig we were all very warm, and i must say all bands played an amazing show. Finally it was time to go and get sum sleep, but most of us didnt go bk to bed it was only me, Mark & Lynne who went. 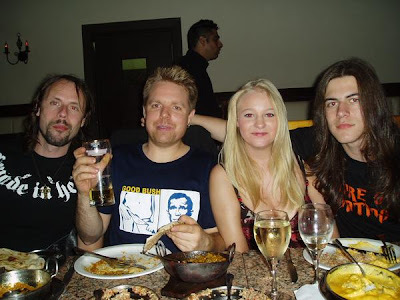 The rest of Toxic, Fury UK, & Firebrand Super Rock went to a night club, hehe who knows wot they got up to haha. This is the final Tour blog that i will do now, this will finish up on all the dates that we performed with Core of Nation. On the 25th September, We set off to Liverpool with some of our old friends tagging along, Alan, & Linda who have been following the band for some time now, and have grown to be some great fans & friends. Also Cocker the Rocker who first met us at an AC/DC convention and has followed the band ever since. Cocker the Rocker has also brought some of his friends like Samson who is a great guy and good o have a chat with, and Bruce Dickinson haha now i bet your all wondering is it the real Bruce Dickinson from Iron Maiden, but no we just think he looks like him very much, and we always like it when he has a little sing with us haha. So, we set off to Liverpool for again another long drive, these roads never end when your on tour. We arrived at the venue and things were looking good. Unfortunately for Chris he had an extra spicy Curry for tea that night, and it all came back in a hurry so Chris was in the toilets half of the night haha. Anyway, we all had a sound check and we had plenty of time to spare, so half all of Core of Nation apart from Damma went to get something to eat, and me, Chris, Martin, Damma & Mark stayed in and watched the gear. We were all sat down having a good chat and waiting for the bar to open. As soon as the bar opened Martin, Chris & Mark rushed off haha. So it was just me & Damma left alone hehe. We got in a sarcastic fight after a while hitting jokes against each other haha, the last one i said was that your a swedish dwarf, but then Damma looked all upset then i was like oh im sorry Damma i didn't mean any harm at all, but suddenly he jumped on me, i had a little Swedish guitarist jumping on me with his big beard lol. The next day we headed off to Doncaster to play the Hallcross Rock Bar. We have been to this venue many times and have went down very well. But we are usually a bit scared of the owner Gary who is a bit crazy haha, but he is a great laugh and treats us very well. We were all very tired and yet again we had another 2 hour drive to Doncaster. Alan & Linda also came with us that night. But we had our 2 of our best roadies aswell Mike & Nick, who love to have a drink now and then. When we arrived at the Hallcross we met our good friend Mick who was taking pictures for us at the gig. We met up with Annette, Bo, & Catt who we have known for quite some time now. After the show we were all having a laugh Alan, Nick, Mike, Mick all pissed out of their minds, suddenly it all went silent then Alan went crashing onto the floor. We began our set and we played for 1 - 2 hours, we were exhausted haha. It is a hell of a lot of fun though. We were all sleeping over that night, and the last time we slept over in Doncaster it was alot of excitement haha. We actually found the original Nintendo, but unfortunately the wires were snapped in half haha. We also found some miniature shoes which looked like the Seed of Chuckys shoes. Haha we were even more scared lol. It was a haunted room. The next morning it was another early start to set off to The Fox in Oswestry. But sadly Linda & Alan had to go home for work. The rest of us made our way to Oswestry. Another pretty long drive, id say it was 2 or 3 hours. It was very close to Wales. We finally arrived at The Fox, we were extremely tired and sweaty. So we unpacked all the gear and thought we'd get cleaned up at our Travel Lodge. We have been to the Fox one time before, and we had a brilliant gig last time, and it was the same this time. This was also our last gig of the tour, we were very upset to see Core of Nation leaving, but first we had to celebrate on that night which we all will remember for the rest of our career. This was a special night because at the end of Core of Nations set we had a huge Jam session. At times it was Me, Rickardo, Martin & Rolf. Other times where it was Chris, Martin, & Rickard. Others where it was Me, Hank, Damma, Chris, & Rolf. Like i said this was a night we would never forget. After the Jam we met up with some radio hosts such as DJ Moonlight from JFL Radio & Claire from Oswestry Surround Sound. They were great people and they also did a radio interview with us. We were very pleased that they enjoyed both bands. We were mainly happy for Core of Nation because they came all they way from Sweden and each venue they played they got a hell of a response. Finally the night had ended, we all returned to our Travel Lodge with a fan called Kate, we met her once before the last time we were at Oswestry. So we had a few drinks with her and thrown a huge party at the Travel Lodge. Again this was a night we`ll never forget. Rickardo also brought a little Cigarette holder which was made into a Amplifier so me and him has a little jam in our room. The next morning it was time to go back to Manchester and say our final fare wells to Core of Nation. We were all sad to see them go, but we promised that we will be doing this again very soon. We went to the airport with Core of Nation and said bye 1 last time. On a final note we would like to thank everyone who attended the shows on the Tour, all our fans & close friends who supported us along the way, the Road Crew for doing an excellent job at lifting gear, all the radio hosts that came to the shows, to all the venues and pubs that let us play, to Rocksector records for making all of this happen, and finally to Core of Nation who played excellent at all of the shows and never stopped trying. We will miss you guys, and hope that you will be successful in the future. We this is the last blog on the tour, i hope you guys have enjoyed everything ive said and took in what Fury UK do on tour. Ive learnt what they do, and i love every second of it. 8th October, Wednesday morning & we headed down to Tamworth, near Birmingham, in horrendous traffic (mainly at the Manc end of things) to call in at the Rock247Online radio studio. We were booked in to do an interview/co-host & acoustic session with our excellent mate DJ Payney. His show The Daily Pain goes out each weekday at 11.00am-2.00pm. First of all got to say big thanks to our host, Payney, who made us totally welcome. The whole thing went really fast & was an absolute blast. We had a great laugh & talked some sh*te along the way we're sure but all good fun. Was also a pleasure to meet the man behind the scenes, station owner Simon who also a cool dude. Many thanks also Simon firstly for operating such a cool station & secondly for letting Payney put the likes of us on the show! The acoustic session went well. We've listened to it afterwards & sounds pretty good. Martin, complete with DIY shakers & a set of bongos which in honesty we found lying round the studio! Chris & Luke of course playing the acoustic guitar & bass awesomely provided by Cort under the endorsement arrangement. Big thanks to Roger, our contact on behalf of Cort, for his support as always. Hopefully, we'll be able to edit & put out some of the acoustic material one day soon so those of you that missed get a chance to take a listen. Here's a few piccis to be going on with. 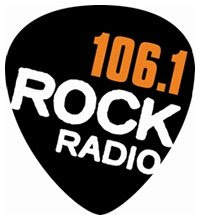 Winners of Rock Radio Scotland "Future Classics"
Many of you will remember that back in June we were the very first winners of Rock Radio Manchester's "Future Classics" award & we were interviewed by DJ Paul Anthony on his show & he played our track "Salvation". Well, we're delighted to say the band has now won the Rock Radio Scotland "Future Classics" this week (ending Friday 11th October). "Salvation" was again the chosen track receiving airplay on DJ Tom Russell's show. It's an honour really to be the first band to have won both the Manchester & Scotland "Future Classics" & thank you to everyone that voted for us & to Rock Radio for putting us forward. It's great also that we're up in Edinburgh, Scotland this coming Wednesday (15th October) to play as a part of Toxic's Tour of Fear, also joined by our excellent friends Killheathen & Firebrand Super Rock. The venue is Bannerman's & doors are open 8.30pm. So the following morning after the Bedford Park Hotel show, Damma, Rolf, Chris & Martin went off to do a radio interview with DJ Catbird at Total Rock Radio, which went very well for the boys. Big thanks to DJ Catbird for that also for coming to the Purple Turtle show later that same day, together with DJ B1 from Braingell Radio who also came to the show with his partner G. Awesome! Meanwhile this left Me, Mark, Rickard, Rickardo, Hank & Nicklas, to pack all the gear up from the venue. But whats a morning without a breakfast haha. While we were eating our big full english breakfast, Hank came down with his Monkey business shirt on haha, which was just perfect lol. Anyway, later on we arrived at the venue, all tired sweaty and stinky, btw on tours you dont really have that much time for a shower so its just 5 or 6 fully grown men all sweaty and stinky imagine that haha. Well apart from me i always make time for a shower haha :). We lugged all the gear in the van and we set off to Camden, to play at a venue called The Purple Turtle. It was a long drive, about 2 or 3 hours. Later on we met back up with Damma, Rolf, Chris & Martin, and we set off to the Purple Turtle which was only round the corner of where we were staying over night. The gig was awesome, we played along side a local band called Cavalar who were top, they had a great singer, and the drummer was on fire. Core of Nation were top of their game as usual. Never seen them have a bad gig and i think we had a pretty gd set aswell, if i do say so myself hehe. Later we returned to the hostel with some take away Hot chicken and chips, how tasty lol. Then it was time for some sleep. The next morning it was another early wake up call by the boss ( Mark ). We had to get off early to the Yorkshire House in Shrewsbury. We have never played here before so it will be a gd first timer. We got to the venue and it looked really good, it was a complete rock theme goin on the walls, and they had ACDC wallpaper, Judas Priest, Iron Maiden, Megadeth. I felt like i was in heaven. When we got all set up we were ready to play, we were really excited and ready, there was something about the venue that made us know that it was going to be a good night. When Fury UK started playin 2 hot blondes caught my eye, and i was in luck haha. After the show we got talkin hehe well i wont say more now haha. It was a very gd gig and we all made some new fans and sum new friends ;). As soon as we finished playin we had to rush off back to manchester as we were going to play Grand Central the night after. So another long drive home lol. The night had come when we were in Manchester, setting up to play. We had yet again a very gd sound and a gd gig. Core of Nation were especially gd this time one of the best ive seen them play. After the show we chilled out for a while. We had a chat with the manager Tony, had a drink or 2, and terrorized Hank lol. Me, Mike ( who is our roadie ), Chris & Martin, love to have a little fun with Hank. Hehe just a little game we play. Also our radio friend Josi came along with her 2 South African friends. They were all a great laugh and was very happy to see them. Thank you for comin Josi! Finally the time had come where we were kicked out of Grand Central and sent home haha. We had a really good gig, we always love playing Grand Central because the atmosphere is brilliant. This is the 2nd out of 3 blogs i am doin for you guys on the UK Tour. So 1 more to go after this. So p[lease check out the next one soon. Well we are still recovering from the 2 weeks of touring with our Swedish friends Core of Nation. Wednesday 17th September Core of Nation arrived in the UK. Me, Chris and Mark ( Manager ) were all waiting patientlly for them to arrive. Suddenly me & Chris thought of making a special surprise for the drummer of Core of Nation : Hank. So we decided to make him a big sign saying "We love you Hank" (big joke from last. Finally they arrived, and Hank was ecstatic haha. We all gave him a big hug, then he was very scared haha. That evening we decided to celebrate by going to an Indian restaraunt in Whitefield. Core of Nation loved every second of it, and enjoyed meeting us once again. We made them feel right at home. After the meal Core of Nation returned to their Travel Lodge. 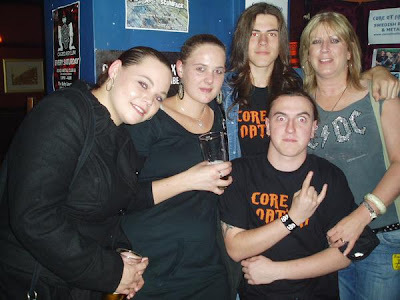 Skipping a few days where Core of Nation were playing with other bands such as Breakdown & Babylon Fire, then Fury UK & Core of Nation were on their way to London. So we had an early start in the morning, the time was about 6 or 7 AM. Which never goes down well with our drummer Martin, he likes a good lie in. hehe. As soon as Core of Nation arrived, we had to leave ASAP. There's only 3 seats in our van, so that was Mark, Chris and Martin. So i had to drive along with Core of Nation, which was a very brave and funny thing to do haha. So let me introduce Core of Nation, there is Rolf, Damma, Hank, Rickard and Rickardo. As soon as i fastened my seat belt, Core of Nation started teaching me Swedish. The first thing they taught me was how to order a Pint. But unfortunately i forgot how to say it haha. But the one saying that they did teach me was "ARMGNOG" this saying i dont think any woman should know haha. Anyway, half way to London we needed to stop for some food and bathroom break. So it was time to torture Hank haha. If anyone doesnt know already Hank has a very big Homophobic issue, so as soon as he told us we were all over him, just to scare him a little haha. We had our little break then we set off to London for the next 2 hours. Well at least we thought it was going to be 2 hours the whole trip was 8 hours long. When we arrived in London we could hardly stand. Oh before i forget Core of Nation also brought a friend called Nickolas. Who was having a beard contest with Martin. But Martin had a slightly longer one haha. We finally arrived in London, and didnt have time to check into our Travel Lodge so we rushed to the gig. The gig took place at the Bedford Park Hotel. It was a good place and a good venue, we had a desent crowd and both bands made some new friends. After the gig we packed all the gear up and went back to our Travel lodge, it was time for sleep. So we said night night to Hank and went to bed. Haha. The following morning Chris, Martin, Damma, & Rolf went to go do a radio Interview at Total Rock, meanwhile the rest of us had to get all the gear and set off to Camden. 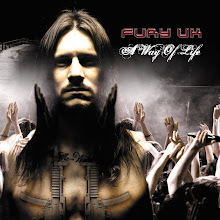 Fury UK planning new album for 2009. Recording sessions are scheduled for the beginning of the year & it's expected the album, which as yet is untitled, will feature brand new material as well as some of the best songs from previous demo CDs. Fury UK are to headline the Helloween Ball at The Met Theatre, Bury, on 29th October, with an excellent line-up completed by Babylon Fire, Decadenze, Code Zero & Liquid Theory. Tickets are available from the Met Theatre box office or direct from any of the bands.